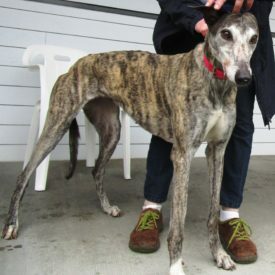 Fannie, born on March 10, 2011, is a light brindle girl. She can be a picky eater, so she’s been eating 2-1/2 cups of kibble with a can of Pro Plan dog food. She does not seem to like additional water added to the food. During Fannie’s dental, teeth were extracted. The extraction sites are healing well and the sutures will dissolve on their own. 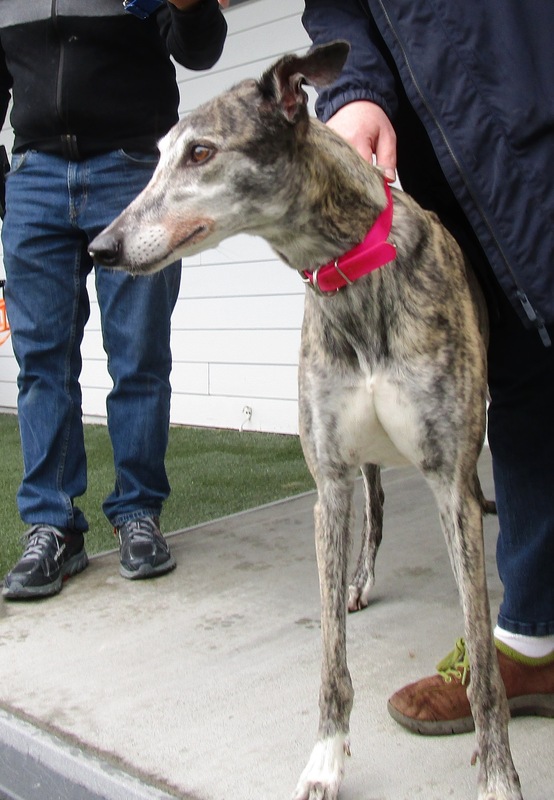 Fannie is a sweet mellow girl. She enjoys attention, but she’s not pushy. She crates well and is used to receiving a treat when she goes into her crate. Fannies shows a lot of interest in cats and should not be trusted with them. If the behaviour is strongly and consistently discouraged, it may improve in time. 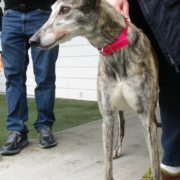 Fannie interacted well with the other Greyhounds and responded well when meeting Jack Russell Terriers. Caution should always be exercised with smaller animals, especially outdoors.